There are three ways of determining who “the rich” are. It could be those with the most income, biggest net worth, or largest lifestyle. These first two definitions (the most income and biggest net worth) frequently define the same set of people. However, the third definition of “the rich” as the most luxurious tends to be a different set of people all together. A luxurious life is certainly easy to achieve, but having a large lifestyle is hardly something to aspire to. 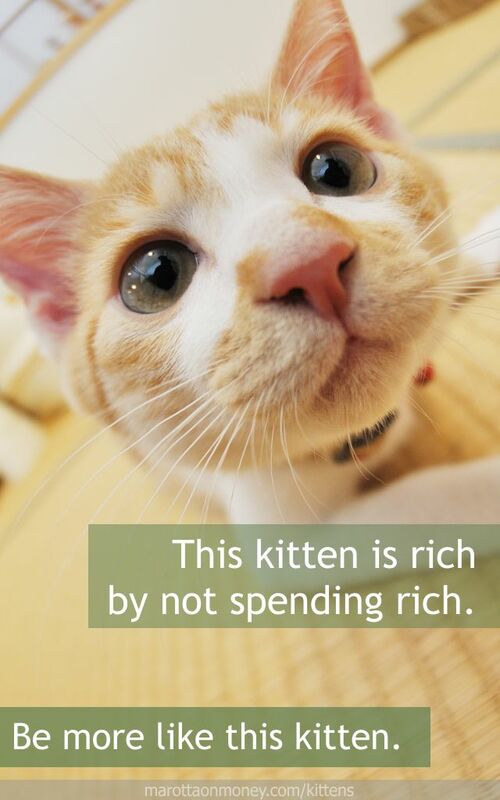 Although many people with a large income and big savings have the ability to live rich, this kitten knows that the way to truly be wealthy is to live within your means. She lives on a budget and intentionally makes her purchases. She doesn’t buy high quality, expensive items when she doesn’t appreciate that added value. She buys inexpensive food and clothing, for example, both of which aren’t that important to her. And she fixes her own litter box rather than paying someone else. She lives within her means, always saving the maximum for retirement. Photo taken by yoppy and used here under Flickr Creative Commons.